Consumer confidence increased slightly over the past two weeks, rising 0.5 points to 53.2 according to the HPS-CivicScience Economic Sentiment Index (ESI). Confidence in the U.S. labor market, however, continued its steady decline from a peak of 51.1 on October 30. Four out of the ESI’s five indicators increased over the past two weeks. Confidence in personal finances increased the most, rising 1.7 points to 67.6, its highest level since February. Consumer confidence in making a major purchase moved up by 1.3 points to reach 53.8 points, and confidence in the housing market rose by 1.2 points to hit 48.2. Confidence in finding a new job was the sole indicator to drop, declining by 2.1 points to hit a level of 47.1 points. While the other four indicators increased as Black Friday and Cyber Monday sales hit record highs, the decline in confidence in the U.S. labor market came as U.S. weekly jobless claims hit a 4-month high last week. The three-day rolling average ended the observation period at a reading of 53.4, 0.7 points off its high of 54.9 points on Tuesday, November 20. The next release of the ESI will be on Tuesday, December 11, 2018. This entry was posted in Information and Insights on November 27, 2018 by Mike O'Toole. Consumer confidence fell by 0.9 points to 52.7 over the past two weeks, according to the HPS-CivicScience Economic Sentiment Index (ESI). Economic sentiment toward the labor and housing market experienced the largest declines as overall consumer confidence fell for the second week in a row, amid market volatility and mixed economic data. Four out of the ESI’s five indicators decreased during the reading period. Consumer confidence in the labor market experienced the largest decline, dropping by 1.9 points to 49.2. The decrease in confidence in the labor market was almost matched by a 1.7 drop in housing market confidence, which fell to 47.0, almost the indicator’s lowest level this year. Consumer confidence towards the broader economy fell by 1.0 point to 49.0. Economic sentiment towards making a major purchase fell slightly, declining 0.1 points to 52.5. Confidence in making a major purchase was the only indicator to rise, increasing 0.4 points to 65.9. The decline in consumer confidence comes amid a more turbulent and volatile economic outlook. In recent weeks, stock market volatility has increased, housing market data has disappointed, and interest rates have continued to move upwards. The ESI’s three-day rolling average ended the reading period at 53.6, slightly below its peak of 54.2 on Monday, November 12. The next release of the ESI will be on November 27, 2018. This entry was posted in Information and Insights on November 13, 2018 by Mike O'Toole. Consumer confidence remained relatively flat over the past two weeks, falling 0.2 points to 53.6 according to the HPS-CivicScience Economic Sentiment Index (ESI). Confidence in the U.S. labor market continued to climb to new heights, while other categories declined. Consumer confidence in making a major purchase experienced the largest decrease, falling 1.3 points to reach 52.6, its lowest level since September. Consumer sentiment towards personal finances fell by 0.3 points to reach 65.5 points, which was counterbalanced by a 0.6 point increase in sentiment towards the labor market, which reached another record high of 51.1 points. Confidence in the U.S. economy also fell 0.5 points to hit a level of 50.0 points, reversing most of the gains made during the previous reading period. Additionally, consumer confidence towards the housing market increased slightly, moving up 0.1 points to 48.7 points. The U.S. unemployment rate also continued to decline, reaching a 49-year low according to the most recent jobs report. Meanwhile, economic growth has exceeded 3 percent the last two consecutive quarters. The three-day rolling average ended the observation period at a reading of 54.1, 0.7 points off its high of 54.8 points on Tuesday, October 23. The next release of the ESI will be on Tuesday, November 13, 2018. This entry was posted in Information and Insights on October 30, 2018 by Mike O'Toole. Consumer confidence increased 0.6 points to 53.8 over the past two weeks, according to the HPS-CivicScience Economic Sentiment Index (ESI). Elevated levels of confidence in the U.S. labor market drove the index’s overall upward movement. Since the launch of the ESI in 2013, it is the highest measured level of economic sentiment towards the labor market. This is the also ESI’s highest level since the end of February 2018, when it reached 54.3 points. Four of the ESI’s five indicators increased during the reading period. Consumer confidence in the U.S. labor market experienced the largest increase, rising 2.4 points to reach a record high of 50.5 points. Consumer sentiment towards the broader U.S. economy rose by 0.8 points to also reach 50.5 points, and sentiment towards personal finances rose by 0.3 points to 65.8 points. Additionally, consumer confidence towards the housing market increased slightly, moving up 0.2 points to 48.6 points. Consumer sentiment towards making a major purchase was the only indicator to decrease, dropping from 54.3 points to 53.9 points. The large increase in consumer confidence in the labor market comes as the Labor Department reported that U.S. unemployment hit a 49-year low in September. The three-day rolling average ended the observation period on a low note of 51.5 points, 4.7 points off its peak of 56.2 points on Monday, October 8. The next release of the ESI will be on October 30, 2018. This entry was posted in Information and Insights on October 16, 2018 by Mike O'Toole. Consumer confidence remained relatively unchanged at 53.2 points over the past two weeks, according to the HPS-CivicScience Economic Sentiment Index (ESI). After declines from its 2018 peak on February 6, the ESI has mostly held steady, averaging 53.3. Two of the ESI’s five indicators increased in the past two weeks. Consumer confidence in making a major purchase experienced the largest increase, rising 1.4 points to reach 54.3 points slightly below its highest level of 54.4 this year. Consumer confidence in personal finances also rose to 65.5 points. Meanwhile, consumer sentiment towards the labor market and the U.S. economy experienced decreases of 1.6 and 0.9 points, respectively. Consumer confidence in the housing market also fell slightly, dropping 0.3 points to 48.6. The ESI’s three-day rolling average ended the reading period on a low note of 51.9 points, 3.3 points off its peak of 55.2 points. The next release of the ESI will be on October 16, 2018. This entry was posted in Information and Insights on October 2, 2018 by Mike O'Toole. As summer officially ended over Labor Day, consumer confidence jumped slightly to hit a reading of 53.3 points over the past two weeks, according to the HPS-CivicScience Economic Sentiment Index (ESI). The index rose a total of 0.5 points, its highest overall reading since May 29th. The increase in the ESI was driven by consumer confidence in personal finances and making a major purchase, while economic sentiment towards the broader economy fell by 0.5 points. Overall, four of the ESI’s five indicators increased during the two-week reading period. The largest increase was in consumer sentiment towards their personal finances which rose to a reading of 67.4, a 1.3 point increase. Meanwhile, consumer sentiment towards making a major purchase increase 0.9 points to 54.1, slightly off 2018’s high of 54.4. Economic sentiment towards the housing market rose by 0.4 points to 47.8 while confidence in the labor market remained unchanged. The only indicator to fall was consumer confidence in the broader economy which fell 0.5 points amid escalating trade tensions between the U.S. and Canada, with rising uncertainty over a possible trade deal between the two nations. Over the course of the two-week reading period, the three-day rolling average rose 1.5 points, rising steadily between the beginning of the reading period on August 22nd and August 31st. The moving average then fell slightly to end the observation period at a reading of 53.6 points. The drop in the ESI comes as NAFTA renegotiation remains imperiled with doubt. Following the news of a bilateral deal between the U.S. and Mexico on Monday, August 27th economic sentiment rose steadily, however, following the news that an agreement had yet to be reached with Canada on September 1st the moving average fell 0.7 points and then continued to fall until the conclusion of the reading period on September 4th. This entry was posted in Information and Insights on September 4, 2018 by Mike O'Toole. Consumer confidence remained relatively steady at 52.8 points over the past two weeks, according to the HPS-CivicScience Economic Sentiment Index (ESI). The index rose a total of 0.1 points, increasing from a reading of 52.7 on August 7th. Consumer confidence in the broader U.S. economy jumped 2.1 points, but this change was offset by a 1.2 point decline in consumer sentiment towards the housing market. The consumer confidence trends reflect the latest economic data, which shows a strong U.S. economy paired with a “soft” housing market that faces tight supplies and rising prices. This entry was posted in Information and Insights on August 21, 2018 by Mike O'Toole. Consumer confidence remained steady over the past two weeks, according to the HPS-CivicScience Economic Sentiment Index (ESI). The index moved down a mere 0.2 points, falling from a reading of 52.9 on July 24 to 52.7 on August 7th. Escalating trade tensions, inflationary economic pressures, and rising geopolitical tensions have led to growing uncertainty about the broader U.S. economy. Yet despite the heightened economic insecurity, the ESI is 0.6 points above last year’s level, indicating relatively stable consumer confidence over the past year. This entry was posted in Information and Insights on August 7, 2018 by Mike O'Toole. 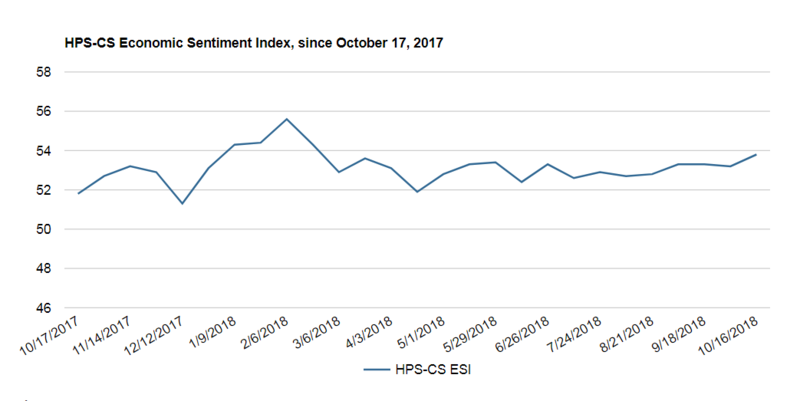 Consumer confidence improved slightly over the past two weeks, according to the HPS-CivicScience Economic Sentiment Index (ESI). The index moved up 0.3 points, rising from a reading of 52.6 on July 10 to 52.9 on July 24. This marks the fourth reading period in a row that the ESI has reversed course. The recovery in economic sentiment was driven by a 1.1 point increase in consumer confidence in making a major purchase, the largest change by any subcategory during the reading period. This entry was posted in Information and Insights on July 24, 2018 by Mike O'Toole.